PokerStars (as well as many other poker operators) announce information about upcoming tournaments in the table window. The information is shown for a couple of seconds. You see the information in the middle of the window. How would you go about to get more information and register? I would click in the information box. But that doesn’t work! To go to the register dialogue you have to click on the little arrows at the bottom right of the window. Why make it so small and hard to find? PokerStars could make it easier for the players by making the whole window clickable. It is especially hard to click when you make your poker table window smaller. 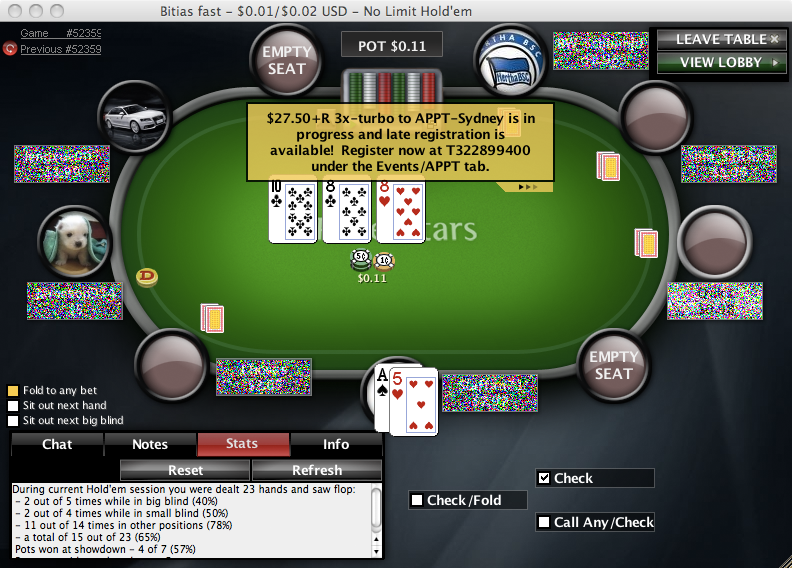 So my advice to PokerStars is to make the whole window clickable. This increases the possibility to register for a tournament you might find interesting.